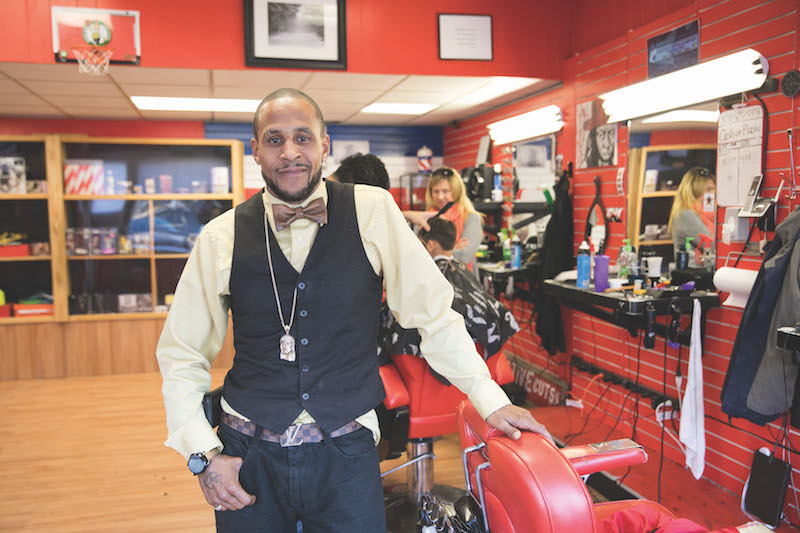 Blair Hill, owner of Native Cuts, runs so much more than a barber shop. The Vineyard Haven native, part Wampanoag, part African American and 100 per cent in love with what he does, says his shop is a welcome gathering space for all. In his early days as a barber here, he worked at Bert’s Barber Shop in Vineyard Haven, Benito’s in Oak Bluffs and finally opened his own place 12 years ago, first on Evelyn Way in Vineyard Haven and now on State Road, next to Lapel’s cleaners. He left the Island to attend barber school and worked in Boston for awhile, but was compelled to return. He has four daughters, all born on the Island. Lots of kids raised here leave for good. Why did you come back? Because I grew up here. It’s unexplainable how different this place is. It was just beautiful — tolerant and comfortable — sheltered but open at the same time. When I was growing up, kids came here from all over the world, they stayed the summer, you got to know them, became good, good, friends. I wanted all that for my own kids. Honestly, it was one morning when I was 18 or 19. I had been partying the night before and I woke up on my mother’s couch with her tapping on my forehead. She said, “You’ve go to do something! You are a year out of high school! You have to show me something!” Right then it was almost like an epiphany. I thought, I want to go to barber school! Growing up, I had experimented on the neighborhood kids. What finally made you go out on your own? I learned a lot from people I worked for, but I was wanting to run my own show. In this business, I’m a bit of a counselor, a bit of style guru, a bit of a best friend, a bit of an uncle, a bit of a dad. It all whirls in here. I learn something every second just talking to the people. It’s therapy and I know it is therapy for everyone else. I’ve got guys who come once a week, twice a week, for just a quick clean up and a chance to talk. It’s a calling, you know? So this is more than a barbershop? Aw, it’s a way of life. Really, it’s a way of Island life. You can be having the worst day . . . I don’t know, your dog died, your car caught on fire, your house burned down, and just come in. By the time you leave, you’re refreshed. And mentally, it does something. It’s medicine. I have seen pictures of some pretty intricate hair styles coming out of this place. How does that happen? Do people bring in pictures? Sometimes. But other times clients will say, “Go off the top,” meaning, “Go ahead, whatever you see to do, do.” I love clients like that because it let’s me create. I have to be honest, if I hit the lottery tomorrow, (although it may be just one day a week), I’m cutting hair. It’s food for my soul.